This soup can be served in summer as drinks. It helps to clear away heat, regulate the spleen and soothe inflammation. Those who want to lose weight can take this soup as regular drinks. 1. Wash Job's tears till water is clear. 2. Boil water in a pot. Add in Job's tears. Bring to a boil again. 3. Turn to low heat, simmer for 50-60mins. Tips: If you soak the Job's tears 2-3 hours in advance,it'll take shorter time to cook it. But I don't think it's necessary if you have enough time. You can add more water if you want to drink more soup. Small red bean is very effective for removing edema. It also helps to lose weight. 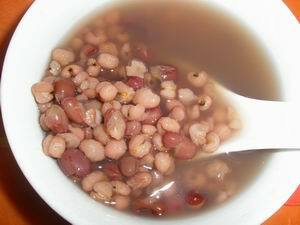 When Job's tears and small red bean cook together it'll strengthen the food therapeutic functions. 1. Wash Job's tears and small red bean. 2. Boil water in a pot. Add in Job's tears and small red bean. 3. Bring to a boil again, simmer for 50-60mins. 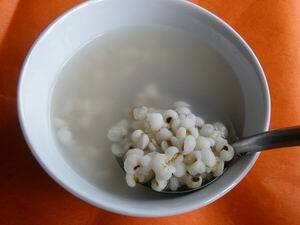 White gourd helps to remove dampness, clear away heat and detoxify our body. It's a good combination with Job's Tears. 1. Soak Job's tears for 3-4 hours. Add in boiling water. 2. Turn to low heat. Continue to cook for 50mins or till the grains break. 3. Add white gourd cubes. Boiling for 15mins in medium heat.